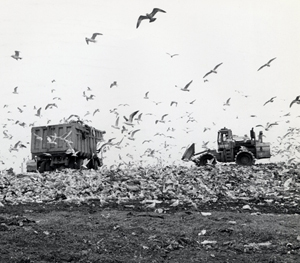 As early as the mid 1950s, the Fresh Kills Landfill became the largest operating landfill on Earth – a title it held until 1999. Operating a landfill became increasingly complicated over this period, with the emergence of environmental protections and regulations along with changing policies and practices. Landfills and incinerators throughout New York City were closed for a variety of reasons, making Fresh Kills, by the mid 1980s, the primary destination for household waste generated in all five boroughs. Martin Bellew began working for the New York City Department of Sanitation in 1983, as a Sanitation Worker, and gradually moved up the Department’s ranks to plan the operational closure of several of the city’s landfills and incinerators. He served as Director of the Department’s Bureau of Waste Disposal, as well as managing its Solid Waste Engineering Division, from 1999 to 2005, and was responsible for ensuring environmental compliance through the closure of the Fresh Kills Landfill. Marty’s talk will focus on the operation and closure of Fresh Kills and how it and other landfills across New York City were affected by changing regulations. He will also discuss engineering, environmental and operational concerns at Fresh Kills, as well as the development of technologies and procedures for on-site methane collection and composting. Accustomed to wearing multiple hats, Marty now works for the City of Yonkers, New York, as Commissioner of the Department of Parks & Recreation as well as Deputy Commissioner of Public Works. Part of the Freshkills Park Talks.